Volunteer in Peru | Tinkuy Peru, Gap Year, volunteer work with children. There is a high level of poverty in Huancayo caused by the following factors; terrorism which occurred back in the 1990s, the weak Peruvian economy, and low quality of education that is provided to them. These children are in need of support because many have been abandoned by their parents. Others have faced displacement due to social violence in the past decade as well as family violence. They are considered to be high-risk youth in need of guidance and resources so they do not end up on the streets. We hope to provide a better future for them. Tinkuy Peru is located in the town of Huancayo, Peru, which is located in the Peruvian Andes Mountains. Tinkuy works with orphaned children and poor families in different areas to promote community development. Our original project is the Mountain School, which teaches around 75 children from 5-17 years old. Volunteers teach from their specialty, English, Math or Arts and Crafts. As a volunteer, you only need to be in the school for a few hours, holding a conversation with some of the older kids in fluent English to realize the difference you are making and the opportunities you are creating. At Tinkuy, it isn't necessary to speak Spanish. We are trying to teach the children English and if you speak Spanish, it is a plus, but not necessary. Our latest project is the development of a healthcare program. The goals of this part of Tinkuy are to provide general care and education to the children and their families at little to no cost. That is why volunteers who are studying in the medical field or those with experience practicing are greatly welcomed. Areas of practice include general pediatrics, social work and dental. Tinkuy offers volunteer opportunities to professionals, trades people, retired individuals - couples, and students of all nationalities who want to share their knowledge and special skills with the people of Huancayo. Tinkuy is especially interested in providing English-language training, which has the potential to help open doors for these children to the global community. The most valuable asset that we have from our volunteers is their time. The volunteers bring a new world and provide a safe and positive experience for the children who often come from broken homes. Ultimately, we hope that it will give the children the desire to stay in school and a better outlook on life. The volunteers try to bridge the gap with education and new experiences for those children who cannot afford all of the basics. Volunteers are the heart of the program and without their continued support, Tinkuy Peru would cease to exist, and the future of our children would not be nearly as promising. 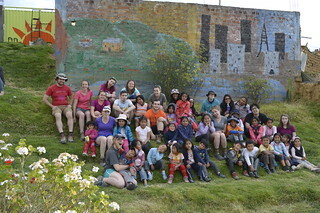 This Volunteer program in Peru is an unforgettable and life changing experience, and many of our volunteers enjoy themselves so much that they end up coming back to Huancayo multiple times. Volunteering in Peru with Tinkuy will be an unforgettable experience. Take a look at the activities we do here in Tinkuy Peru and encouraged to volunteer with us! also improving construction of tinkuy and others with the donations. Our volunteers help us implement these services better for peruvian people. They are the main beneficiaries of this project. If you have any question. please contact us. We are happy to help you.